Francis Livingston, Cottonwood Meadow, Oil on Panel, 40" x 40"
Growing up in Cortez, Colorado, Francis Livingston’s childhood was spent less than 200 miles from the site of one of the greatest movements in American painting, the Taos Society of Artists. Here, in a landscape familiar to Livingston since birth, a group of artists that included J.H. Sharp, Bert Geer Phillips, E. Irving Couse, W.H. 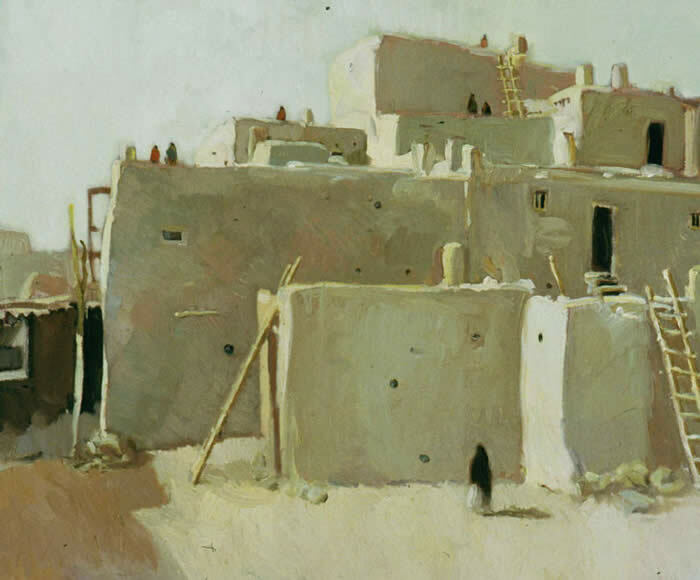 Dunton, Oscar Berninghaus, E.L. Blumenschein, Kenneth M. Adams, Victor Higgins, E. Martin Hennings and Walter Ufer descended upon the lonely western outpost of Taos to form the Taos Society of Artists. Their paintings reflected the landscape and cultures surrounding them. 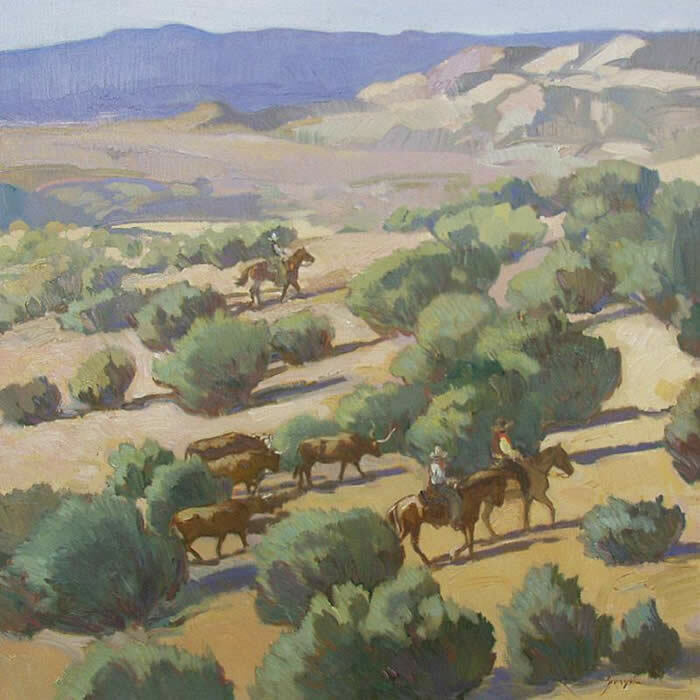 Inadequately categorized as “western painting,” the moods and methods cultivated by these artists varied significantly in style, subject and palette, but shared a genuine attachment to the varied landscapes and peoples of the artists’ adopted home. Though bridges, dams, roadways and housing subdivisions now occupy previously untouched land in many of the regions painted by the members of the Society, a new generation of artists led by the likes of Francis Livingston are working to continue the legacy they left behind. In Livingston’s work we see the Taos Society tradition rejuvenated and enlivened for a new generation of art appreciators and collectors. Francis Livingston, Distant Lands, Oil on Panel, 30" x 30"
Livingston’s original ambitions had little to do with the revitalization of Western American painting. As a fresh enrollee in art school, his aspirations were guided by a passion for comic books. The comic book was the dominant popular art form for at least two generations of American boys, and was the spiritual descendant of newspaper illustrations and serialized stories that sustained many artists during the first half of the 20th century. As a student of the Rocky Mountain School of Art in Denver, Livingston hoped to hone his talents in order to transition from an appreciator of comic books to a creator thereof. Unfortunately for young Francis, his career as a comic book illustrator was over before it began when an instructor informed him that he was “not good at the sequential stuff”. His drawings were more than adequate, but the comic book form demands the artist be able to reproduce accurately characters and scenery from one frame to another, something he was informed he was poorly equipped to do. A potentially devastating criticism became an opportunity waiting to be capitalized upon, as the same instructor advised Francis to enroll in fine art courses. Fine art eventually brought Livingston to San Francisco, where he studied at the San Francisco Academy of Art. He transitioned from student to teacher in San Francisco, teaching at the Academy for ten years. While teaching and illustrating, Livingston developed a fluid style influenced by a concert of American masters. Beginning with an interest in Sargent and Whistler, Livingston’s time in San Francisco acquainted him with the Bay Area Figurative movement and the California impressionists, expanding his palette and subject matter and further evolving his personal style. Unlike any of these artists, however, Livingston developed a more populist style, creating wistful and surprisingly cheerful images of decaying boardwalk amusement park rides, curvaceous forms of classic American automobiles, crumbling theater facades and hazy rooftop vistas, replete with water tanks, smokestacks and lines of laundry drying in the open air. Livingston celebrated on canvas this bygone era of confident and optimistic American design and development. 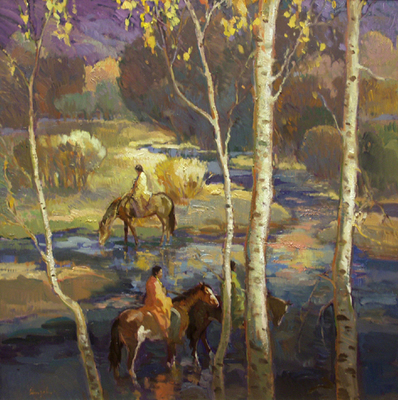 Francis Livingston, Autumn Reflections, Oil on Panel, 30" x 30"
Francis’ instincts were prescient considering his current position as one of the leading artists and illustrators of the American West. Awestruck by the majestic landscapes and profoundly interested in the native cultures, successful commercial artists like Oscar Berninghaus disembarked from urban centers of the United States and descended upon Taos, Santa Fe and other centers of native culture and natural beauty to record the untouched west in advance of the encroachment of civilization and its mines, mills and railways. Robert Henri and John Sloan of the Ashcan school, both illustrators and teachers also transitioned from scenes of burgeoning urban centers and their inhabitants, to images of the west. Both Henri and Sloan became Associate Members of the Taos Society. Though difficult to view as a coherent theory or approach to painting, the work of the Taos Society and their Ashcan Associates represent nothing less than one of the only pure American painting styles, one that at its peak demonstrated a brilliance much less influenced by the European-developed method and theory in practice during the period. Livingston’s widening scope of artistic capacities is born of the same instincts, and the sum of his career production reveals an admiration for the American experience that updates rather than antiquates the mission and material of the original artists of Taos and Santa Fe. 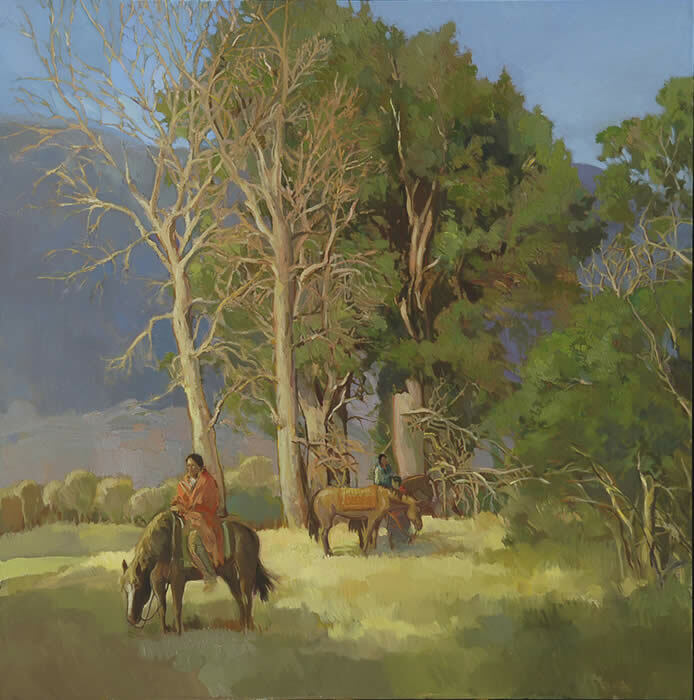 Francis Livingston, Pueblo Trail, Oil on Panel, 27" x 27"
Francis Livingston, West Light, Oil on Panel, 20" x 24"
It is not merely a record of the west that lovers and collectors of western art desire, however, but a narrative of the land and how it came to be shaped as it exists today. Francis Livingston’s work as a painter and an illustrator is culturally significant in this regard. In the same manner that the founders of the Taos Society of Artists recorded the subjects of the American Southwest, Livingston records its history, its moods and its prevailing narratives. In an article for Smithsonian Magazine, Francis demonstrated his talent for historic illustration by supplying poignant illustrations to the story of the Fetterman Massacre, engaging the subjects of the drama in a manner familiar to appreciators of the Taos Artists. By utilizing the portrait, Livingston’s broad, impressionist strokes bring us face-to-face with Captain Fetterman and Red Cloud, without any of the period window-dressing or romantic imagery associated with historical peinture. Instead, they serve as evocative additions to the ever-refined record of the west, modern interpretations of a story whose scope has yet to be grasped and whose emotional impact is in the process of constant interpretation and redefinition. 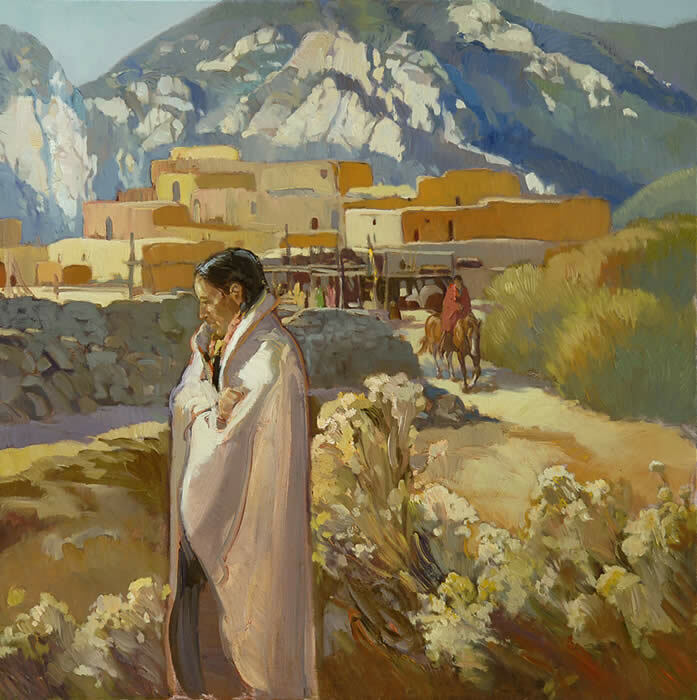 It is an aim that would be familiar to the painters who first decamped from the industrial centers of the nation and traveled across America in order to call Taos home, and whose motivations included a desire to ensure that the cultures of the West were not lost forever. 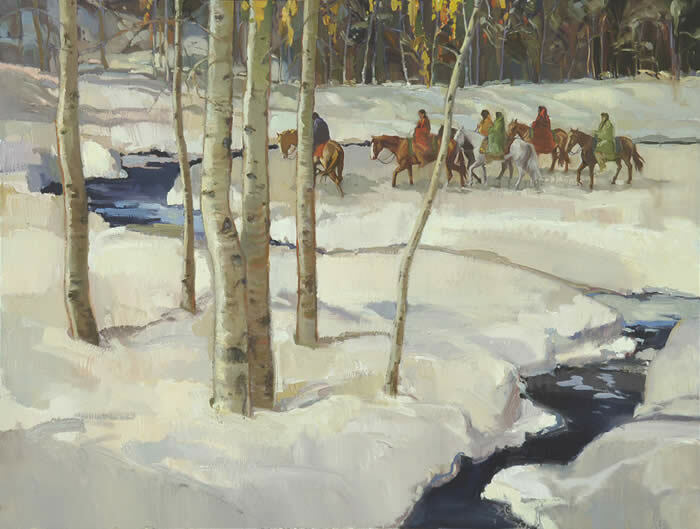 Francis Livingston, Mid Winter Journey, Oil on Panel, 36" x 48"
Of course, ethnography is a less prominent end for the modern painters of the American west. The life of the inhabitants of the southwest pueblo so famously recorded by the early painters of the west is radically changed since J.H. Sharp first visited in 1893. A map of the lower left quadrant of the nation today reveals meandering ribbons of interstate highway, grayed blotches of population centers and man-made lakes where once there were valleys. Many of the historic sites once unseen by the white man are now national parks, with cordons leading camera-wielding tourists through carefully designed educational experiences. The off-ramp gas station is the new trading post, and jetliners cut travel times from months to hours. The gradual diminishment of the old west, now all but complete, has done nothing to loosen its hold on the imaginations of modern day America; in books and films, as well as in the visual arts, the final frontier of American expansion and discovery still captivates us. Francis Livingston’s work acknowledges all those that came before him in recording the people of this vast, uncharted land, but continues forward with a unique blend of styles and subject matter that keeps western painting vital and relevant.